Abstract. On 7 March 2014, a Boeing 777-200ER aircraft operated by Malaysian Airlines as MH370 on the route from Kuala Lumpur to Beijing abruptly ceased all communications and disappeared with 239 people aboard, leaving its fate a mystery. The subsequent analysis of so-called satellite handshakes supplemented by military radar tracking has suggested that the aircraft ended up in the southern Indian Ocean. The eventual recovery of a number of fragments washed ashore in several countries has confirmed its crash. 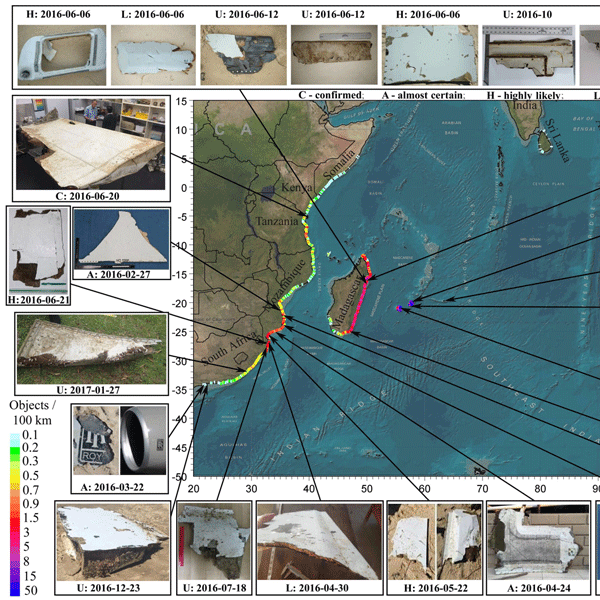 A number of drift studies were undertaken to assist in locating the crash site, mostly focusing either on the spatial distribution of the debris washed ashore or on the efficacy of the aerial search operation. A recent biochemical analysis of the barnacles attached to the flaperon (the first fragment found in La Réunion) has indicated that their growth likely began in water of 24 °C; then the temperature dropped to 18 °C, and then it rose up again to 25 °C. An attempt was made in the present study to take into consideration all these aspects. The analysis was conducted by means of numerical screening of 40 hypothetical locations of the crash site along the so-called seventh arc. Obtained results indicate the likelihood of the crash site to be located between 25.5 and 30.5° S, with the segment from 28 to 30° S being the most promising. 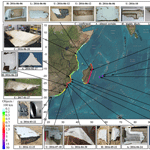 How to cite: Nesterov, O.: Consideration of various aspects in a drift study of MH370 debris, Ocean Sci., 14, 387-402, https://doi.org/10.5194/os-14-387-2018, 2018.